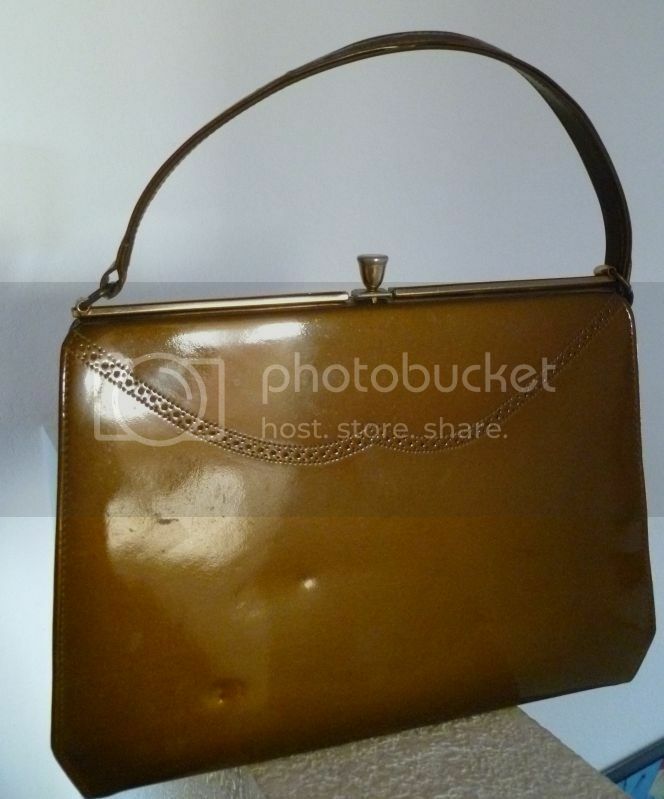 Kelly-Style Bag in Bronze Faux Patent Leather.1960s. Maker: Melbourne Bags. Classic Kelly-style handbag in bronze or copper (brownish with a green hue) faux patent leather, with stitching and tiny hole detail on the front. Goldtone hardware. Inner pocket. Lined in faux greenish-cream leather. I have to admit that I’m more a fan of the showier bags, but this one is very nice. Even though it has some wear (scuffs and such), it’s classically styled and, best of all, it’s SHINY! Bonus pic! Here’s Faith the Mannequin holding the purse. You simply MUST check out her dress. 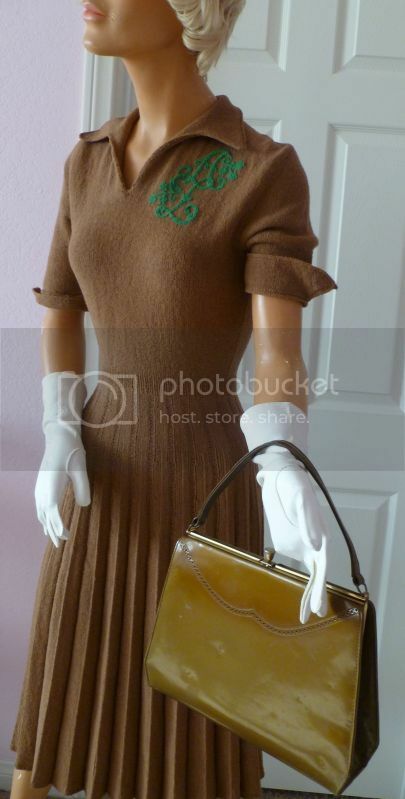 It’s a 1950s brown knit dress—with embroidered green monogram—I got years ago at a thrift store… from the 99-cent rack. Yep, it was a heart-stopping, I-can’t-breathe, attempt-at-poker-face moment. You just don’t find stuff like that anymore. But there’s always hope! So you can imagine the whirl I was in when I found it! It happened to me again about a year ago, at the same store, when I found a Lilli Ann jacket for $3!